A well-planned train station is one of the best investments a community can make as it seeks to expand its appeal as a place for tourism and business investment and also cultivate civic pride. A train station often paints the first impression of a town or city for visitors coming for a long stay or simply passing through. It can be a transportation hub for commuters, a place for the community to gather and an opportunity to spur economic growth and activity. Train stations allow a community the chance to embrace its past while focusing on the future. Stations have always been hubs of civic activity and social centers where family and friends reconnect. Investing in your train station or building a new one can bring jobs, revenue and new attractions to your town. In a report sponsored by The Great American Stations Foundation, Rail Stations: At the Heart of America’s Communities, the foundation’s former president Hank Dittmar outlined the many benefits of station renovation and restoration and has offered permission to share his thoughtful insights. Crowds in Freeport, Maine gather to welcome the inaugural Amtrak Downeaster train in November 2012. Photo courtesy of NNEPRA. Whether they are on Main Street or in downtown, America’s great stations were built in bustling city centers, and hence at the core of our growing metropolitan economy. Cities that invest in station projects are making a visible commitment to downtown revitalization. 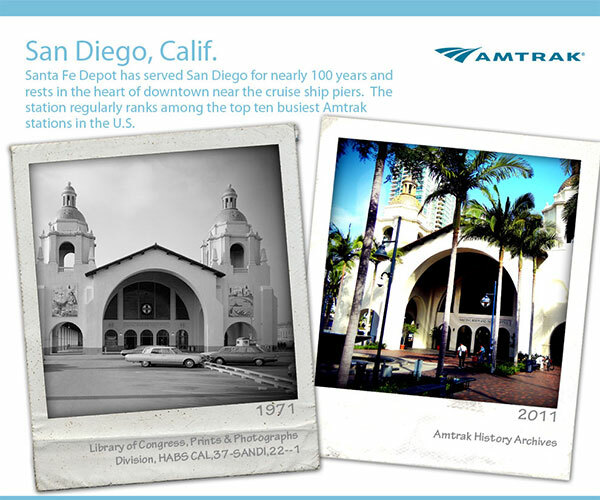 America’s train stations and depots were often built on a grand scale, even in smaller cities. In many cases, the opportunity exists to transform the train station into a mixed-use center of economic activity, while still accommodating train and bus service. In fact, the continual throughput of passengers makes train stations attractive locations for both office and retail uses. Recently built station facilities, which have often included other uses, have stimulated employment and retail sales. The ticket and waiting area at the New Haven, Conn. station. The great stations of our country are important historical and architectural expressions of the growth and development of our nation, and of our core values and beliefs. Designed to embellish cities and towns and bring prestige to their builders, railroad stations play an important role in a community’s collective memory. America’s great train stations have housed offices for the railroads, hotels, eating houses and other facilities, most of which are no longer in operation. In many cases, the opportunity exists to remake the train station into a mixed-use center of economic activity, while still accommodating train and bus services. Time after time, cities find that station renovations spark tremendous demand for community use of the facility. Grand public spaces, they are one of the last expressions of greatness in public architecture, and one of the few places where everybody in a community comes together. Remaking train stations is about knitting community back together.